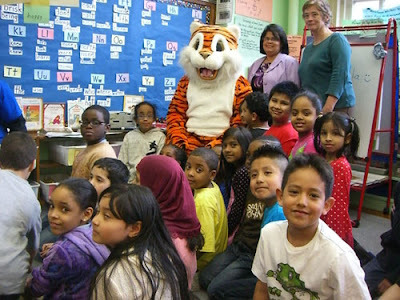 2nd graders at PS 94, where just 29% of students read at or above grade level, enjoy TIGER Day. 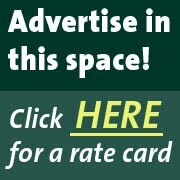 Editor's note: This story first appeared in the April 21 edition of the Norwood News. About halfway through his pivotal starring role as a life-sized, book-loving tiger at Norwood elementary school PS 94, Joe Lawliss removed his foam-rubber mascot head and breathed deeply. It’s all worth it, he thought. Lawliss runs an after-school tutoring program at PS 94. He has two kids of his own. He realizes how important reading is for the development of young minds. It’s the reason he doesn’t have a TV at home and is willing to dress up in a cumbersome tiger costume that makes him feel like he’s living in a sauna. It’s why he will spend the entire day prancing around to various classrooms at PS 94 preaching: Reading is fun! Parent Coordinator Miriam Seminario started T.I.G.E.R. (Together In Getting Everyone Reading) Day — an initiative developed by the nonprofit Literacy Inc. (LINC) — when she first arrived at PS 94 in 2003. It’s her programmatic baby. She spends an inordinate amount of time preparing for it each year: organizing administrators, teachers, parents and staffers as well as recruiting readers, media and, of course, a tiger. “For me it’s important because the future is our kids,” Seminario said, while racing between PS 94’s two buildings in knee-high leather boots. It’s also something that will hopefully encourage students to read at PS 94, where just 29 percent of third, fourth and fifth graders tested at or above grade level in reading on state exams last year, according to Principal Diane Daprocida. Previously, Daprocida said, PS 94 was scoring much higher, with percentages in the 50s, on state exams. But that was a mirage, she said, because the tests had been “dumbed down.” This year, with more rigorous testing in place, the school dipped back to what Daprocida said she believes is a more accurate assessment of her students. A month before Lawliss donned tiger garb, the school’s librarian, Joanne Clarke-Condon, began working with second graders (the grade when kids go from “learning to read, to reading to learn,” Daprocida says) on a reading project in conjunction with T.I.G.E.R. Day. “The challenge was for them to learn about jobs they were interested in,” Clarke-Condon said. So the students began reading about doctors, engineers, lifeguards, chefs, police officers, firefighters, sculptors. Then, they produced reports based on their findings. Not speaking the language is another obstacle. For a large percentage of PS 94 students, English is a second language. The school is filled with immigrant families, many of them Hispanic, but there is also a large Bangladeshi population. Enter “Ms. Seminario.” As parent coordinator, Seminario is demanding and relentless. “It’s easier just to say ‘yes’ to her,” said Lawliss. Her weekly English as a Second Language (ESL) classes for adults are well attended by about 20 to 25 parents, she says. More than a dozen parents showed up for T.I.G.E.R. Day. And the encouragement of a life-sized tiger can’t hurt.